A new online report from McKinsey & Company claims that commodities prices are destined to rise higher and become more volatile as demand from emerging markets comes more prominently into play. 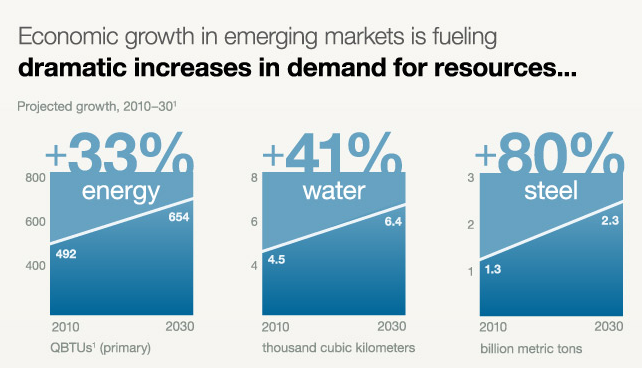 According to the report the economic growth of emerging markets will lead to prodigious gains in demand for resources, with growth in demand for energy and steel projected to rise 33% and 80% for the period from 2010 to 2030. The news should come as a source of much reassurance to miners, who have weathered a tough year due to ailing spot prices for key export commodities such as iron ore and coal. In the report's own words, "in a resource-constrained world, value creation moves towards the owners of resources."